Hope’s story – told by her oncologist, Linda Wainright. 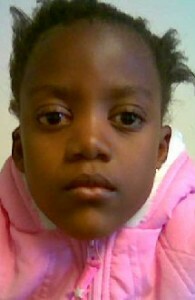 Hope lives with her family in a rural community in central South Africa. Her mother, Sylvia, had been treated for unilateral retinoblastoma as an infant. Although she was cured, no one informed her of the potentially heritable nature of her condition. When Sylvia’s first child, Cameron, was born, he too developed retinoblastoma in one eye. Without knowledge of this condition however, Sylvia did not realize there was a problem with her son’s eye until he was 22 months old. Cameron was examined at Chris Hani Baragwanath Hospital in Soweto, Johannesburg, and immediately diagnosed with unilateral retinoblastoma. His eye was blind, and dangerously filled with cancer. B scan ultrasound and a brain and orbit MRI indicated serious risk to his life, without immediate removal of the affected eye. After the surgery to remove his eye, Cameron underwent chemotherapy and radiotherapy to kill the remaining cancer cells that had begun to travel beyond his eye into the surrounding tissues of his eye socket. Although very aggressive with difficult side effects, thankfully this treatment was successful and Cameron is cancer-free today. Sylvia received genetic counseling at the hospital, to explain the hereditary nature of retinoblastoma. Doctors took valuable time to provide detailed information about the importance of examination under anesthesia to check the eyes of her future children as soon as they were born. Two weeks after Hope was born in January 2000, Sylvia brought her to the Paediatric Oncology Unit at Chris-Hani-Baragwanath Hospital, for her first EUA. Hope already had a large tumour in her left eye, and multiple smaller tumours in both eyes, but the early diagnosis and intervention gave her doctors and family much hope for successful vision-saving therapy. Lasering of each tumour was started immediately, but it failed to stop the cancer progressing. So the decision was made to begin chemotherapy. Even though she was a tiny baby, this was her best chance to beat the retinoblastoma. Doses were lowered because Hope was so small, but over the next four months, she received 6 cycles of chemotherapy. Although the chemotherapy successfully killed a number of the tumours, Hope continued to grapple with one persistent tumour in her right eye, and two in her left eye. Her doctors began to examine the option of radiotherapy, and at 8 months old, Hope and her Mom flew to Cape Town for this vital vision-saving treatment. This was the first time Hope and Sylvia had flown by plane, an experience generously made possible by the organization “Reach For A Dream”. Hope’s battle with retinoblastoma continued upon her return to Johannesburg, Two new tumours developed following radiotherapy, and these were now treated with stronger chemotherapy. However, Hope was older and better able to handle the intense therapy. Regular EUAs kept a very close watch on her eyes, so that laser or cryotherapy (freezing treatment) could immediately be applied should any new tumours arise. Hope continued to defy the odds. She started school in 2007, and is so far winning her battle against eye cancer. She continues to have regular check-ups to be sure she stays well and cancer free. Hope’s story shines a bight light for children in Africa and around the world, showing that retinoblastoma does not have to steal their sight or life. Even those who live in an impoverished rural community can have a great outcome with eraly diagnosis and expert care. Cameron lost his eye, and nearly lost his life, because Sylvia did not know about retinoblastoma. Correct information and awareness allowed her to make informed decisions about her daughter’s care. This led to early diagnosis for Hope, and ultimately saved both eyes. She is truly a vision of Hope for the world.